It’s surprising to me how many younger men are unaware of their prostate and its function! In fact, most men only find out that they have an enlarged prostate, when they go to their doctor complaining about their symptoms, and the conventional treatment they are offered prompts their desire for a natural alternative. Over 30 years ago, I first received calls from men asking if there is anything herbal for prostate problems. After much research, I found an old German herbal that mentioned Epilobium parviflorum. So, working on a hunch, I ordered a quantity of the small-flowered willow herb and I have never looked back. 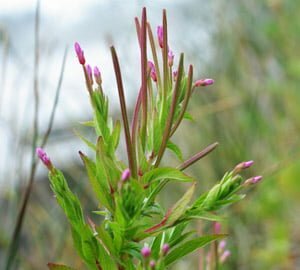 I soon found that a tea or extract made of epilobium has excellent healing properties for all kinds of prostate disorders and I have since recommended it to thousands of men. Testimonials on the benefits of this most important herb have been sent to me from far and wide, including several prominent men who admitted they suffered from enlarged prostates and, after taking the tea, publicly acknowledged its powerful effect, after drinking it only twice daily. There are even instances where men were due to have an operation because their flow of urine was so severely restricted, and this herb brought immediate relief. I am very proud and humbled to have helped multitudes of men over the years and to this day, I’m still receiving phone calls, letters and emails thanking me for sharing the herb epilobium and changing their lives for the better. Many of the famous men who supported me have since passed, such as ultra-marathon “shuffler” Cliff Young, racehorse trainer Jim Houlahan, artist Pro Hart, motoring magnate Bob Jane, singer Smokey Dawson, legendary British jockey and later Australian resident Arthur ‘Scobie’ Breasley; but I will always be grateful to them for helping me spread the word and uncover such secret men’s business, once and for all!